Ilagan City, Isabela—It was another day of celebration for the Wangkay family. Rufo Raguine (left) and Laurize Jeante Wangkay hogged the spotlight in the Batang Pinoy qualifying competitions. 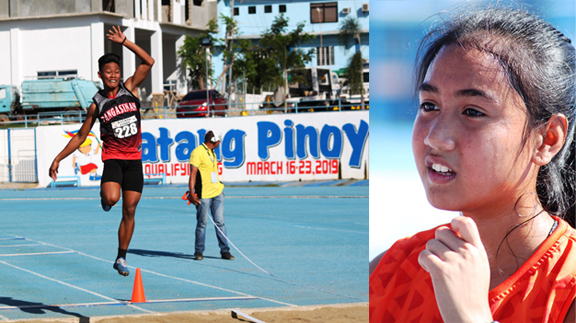 Laurize Jeante Wangkay made her mother proud when she retained the girls’ 15-under 2,000-meter walk title on Day 5 of the athletics’ meet of the Luzon Leg of the 2019 Philippine National Youth Games-Batang Pinoy qualifying competitions here. The day before, Laurize’s sister Qaantreulle completed her stint in swimming with one gold and four silvers in the 12-under action. Quaantreulle, who represents Laguna Province, even settled for a silver in the 100-meter freestyle behind Cainta bet Aubrey Tom, one of the three most bemedalled swimmers, who earned five golds. “Masaya ito. Iyun ang hobby ng buong family namin. Mag-sprint, mag-swimming at magpa-conditioning,” said Genilza-Wangkay, now a 38-year-old high school coach at the La Salle-Zobel in Ayala-Alabang. Laurize’s clocking of 11 minutes and 34.8 seconds was nearly a minute slower than her time in last year’s Palarong Pambansa where she won the gold. “Hindi kasi ako masyadong nag-training dahil sa paggawa ng schoolwork,” said Laurize, a ninth grader at St. Michael’s College, after she gave Binan, Laguna its only gold so far. Jona, a many-time athlete of the year in the UAAP when she was still a student-athlete at De La Salle University, said her three kids are keen on following her footsteps and this makes her and her husband Jun proud. The Wangkay sisters’ feat was matched by Rufo Raguine, an eighth grader at the Virgen Milagrosa University Foundation after winning a third gold medal with teammates in the 4x100-meter relays. Raguine, coming back from an ankle injury, earlier snatched golds in the long jump and triple jump, before leading yeammates Redz Banaag, Irish Cabanayan and Justine Munoz outpace San Fernando-Pampanga and Pasig City for the gold. Laguna Province, behind Quaantreulle and her teammates, overtook Baguio City in the overall medal race with 28 golds, 30 silvers and 27 bronzes. Baguio City (27-31-38) and Quezon City (24-17-48) are close in second and third, respectively. Laguna Province got a lift from Rowee de Luna in 15-under boys’ 400-meter run and the team of Janine Dauba, Kyla Elona, Magvrylle Matchino and Evita Belloso in the girls’ 4x100 meter relays. Hussain Lorana captured a gold for Baguio City in the 15-under boys’ 5,000-meter run. In softball, Sta. Maria, Bulacan took the girls’ softball honors following a7-3 triumph over Dasmarinas City. In basketball, Pangasinan reached the finals following a 61-58 victory over Pasig, while Ilocos Norte earned baseball honors with its 7-4 win over Valenzuela. In boys’ volleyball, Pasig improved its chances of reaching the finals with a 25-18, 25-19 beating of host Ilagan City.